Welcome to the official page of Scratch Day 2016 of the Museum of Computing of ETSINF. Here you will find the necessary material and pieces of advice to carry out the activities. 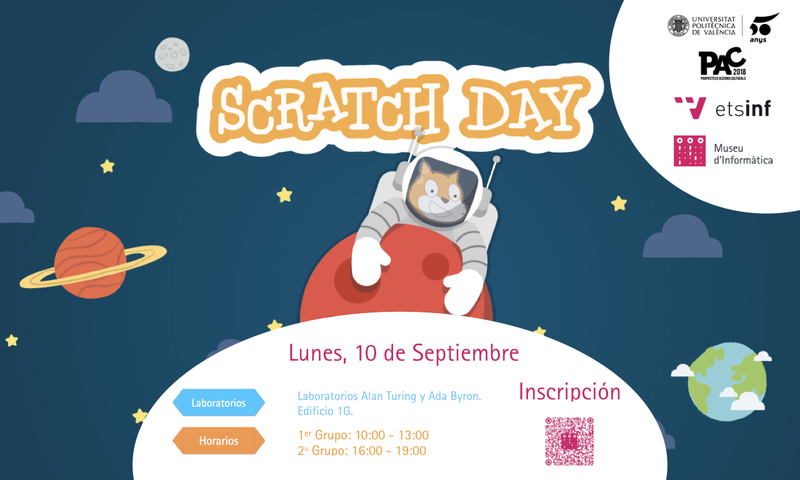 If you were not be able to attend Scratch Day on September 12th do not worry, you can still download the leaflet HERE and do it. 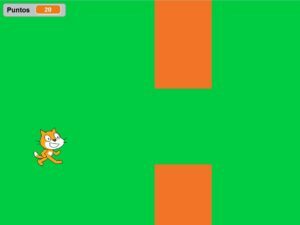 The purpose of this game is to introduce the contestants to SCRATCH with a simple activity. 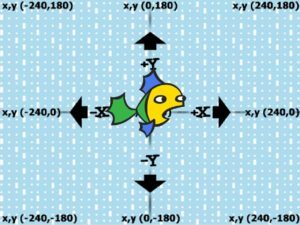 This activity also teaches you about the characteristics of the window for the game and how to control the objects. 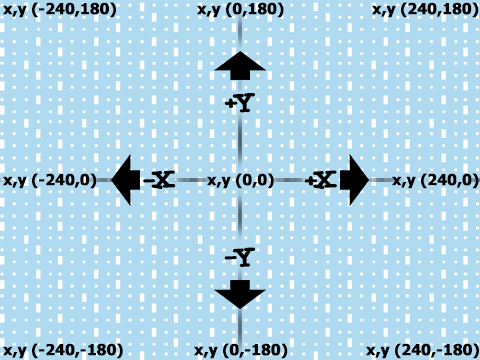 In this game, the person has to control a ghost and it has to go through the labyrinth without hitting the walls. If you do, you will have to start again. There is also a chronometer so do not stand still. Are you able to play level 2 after the first level? Isn’t the game a bit dull? Perhaps it needs sound effects. The night comes and bats go out in the woods. You must hunt them down because there is overpopulation and you want to carry them to another place so they can live happily. The game should have a mysterious atmosphere, it is night time, right? Could you add background noise? You can download some background noise in the Download section below. Putting the pressure on… Do you think you could add the sound so it reproduces the Rattle sound when there are only 3 seconds left? You can find this sound in the Sound Library, in the Effects section. It is night time and something is missing. What if we add some sound effects so the game can have thunder every X seconds. Catch me if you can! Now it is time to play the game par excellence of the Scratch activities given by the museum. 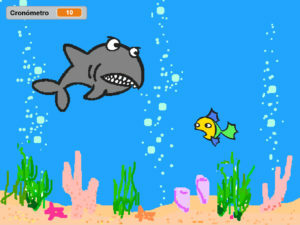 In this game, you will have to avoid the fish being eaten by the shark. I will give you an extra help in the leaflet down below. Everything related to “Flappy birds” is coincidence, or maybe not. Here we have to control our cat and make it pass through all the walls possible. I’m going to make you do this game yourself. Let’s see if you can do it. But first, some pieces of advice. Do the jump first. Let Scratchy jump first and then take care of the walls. 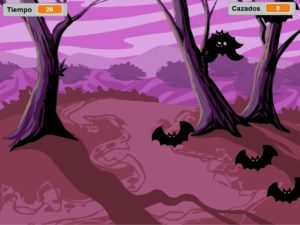 About the walls: think like if you were a bat. 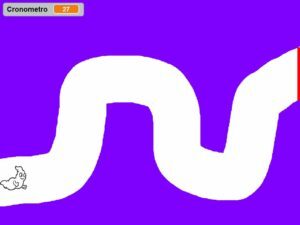 You have to clone it until you reach the end of the screen, then delete and create a new one again. You have reached to the last activity. Now you will have to make something complicated: a game for two! Each player controls a paddle with the keyboard (one player will have to use the arrows and the other WS or QA). Let’s see who can score more goals. What if instead of playing with time, we play to the best of 5? We could increase the speed of the ball if no one scores in a certain amount of time. 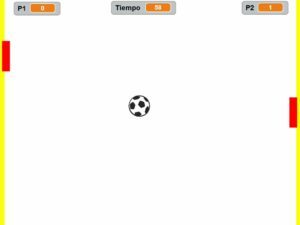 In other words, each time the ball touches one of the paddles, we could increase the time until someone scores. Finally, what if the score could be shown at the end? And we end the Scratch Day 2016 with this. The Museum and its staff wish you enjoyed this and hopefully, this will be useful for you in the future. If you lost your leaflet, don’t worry, you can download it and do it again. Now it is time to create games and emulators and remember, SKY IS THE LIMIT! !